The special feature in this issue focuses on the career and achievements of Pandit Kumar Gandharva, the Hindustani vocalist who passed away in January. It consists of a profile and a group of complementary articles that view his music and related accomplishments from different angles. A part of the Record Rack, at the back of the magazine, is also devoted to an evaluation of his music. The pencil sketch on the cover is by D. Narendran. 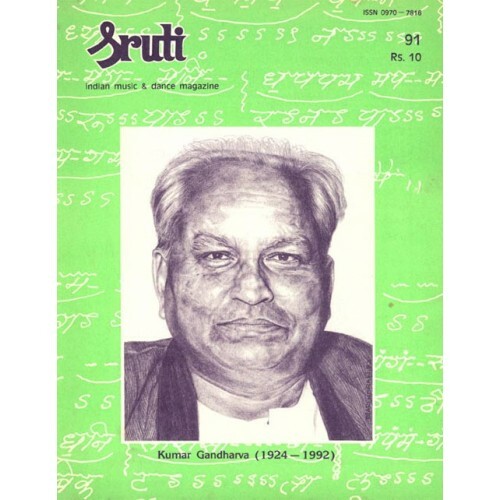 The opening of the profile of Kumar Gandharva identifies him as one of the eminent Hindustani vocalists gifted to the nation by the southern State of Karnataka. This is certainly not the reason why there is a special feature on him in Sruti, but we plan to highlight, through future articles, the fact that quite a few from the South have distinguished themselves in the realm of Hindustani music. Just as we hope to publish features and articles on Hindustani musicians for whom the South has meant perhaps nothing more than masala dosa, sambhar, rasam and Madras coffee. This issue focuses also on Acharya Parvatikumar and his staging of Abhinaya Darpana, a classical treatise, through the medium of dance. The Lady With The Lamplighter, written with a light touch, complements these two serious features and the article on Indian Dance In New York. The News & Notes section opens up with a compendium of reports on selected salutes to Tyagaraja and includes informative and interpretive reports on a few other events as well. The Sruti Box is there, as usual, to receive and transmit your thoughts and reactions.